See 4.18.01 - Edge for Private Cloud release notes. Note: Apigee Edge Developer Channel is not available for installation by the Edge for Private Cloud installer. Developer Channel is available for on-premises installation by a separate script. If you want to install Developer Channel, contact Apigee Support. The Apigee documentation site has extensive information on API BaaS features. See http://apigee.com/docs/app-services/content/app-services-features. 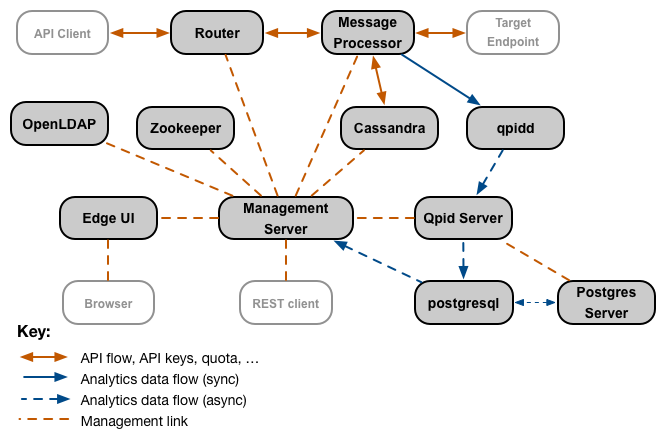 The following diagram illustrates how API BaaS components interact. ElasticSearch - distributed full-text search engine. 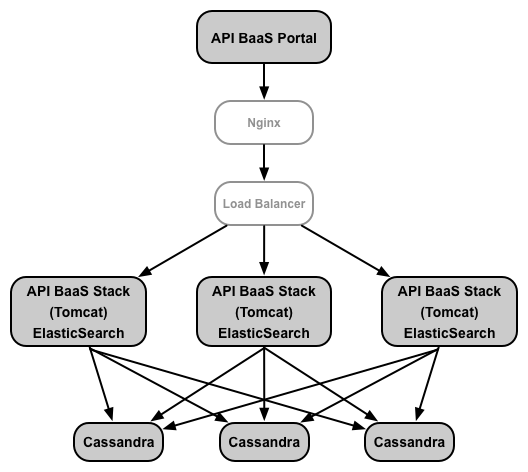 ElasticSearch can be installed on the same node as API BaaS Stack, or on its own node. You can scale the API BaaS REST API capability horizontally by adding Tomcat servers and using a Load Balancer to route web requests to all of your active servers. For more information on getting started with API BaaS, see http://apigee.com/docs/content/build-apps-home. Edge Developer Channel is a template portal for content and community management. It is based on the open source Drupal (http://www.drupal.org) project. The default setup allows creating and managing API documentation, forums, and blogs. A built-in test console allows testing of APIs in real time from within the portal. Apart from content management, Developer Channel has various features for community management such as manual/automatic user registration and moderating user comments. Role-Based Access Control (RBAC) model controls the access to features on the Developer Channel. For example, you can enable controls to allow registered user to create forum posts, use test consoles, and so on. The Apigee Edge for Private Cloud deployment script does not include Developer Channel deployment. Developer Channel deployment on-premises is supported by its own installation script. If you want to install and configure Developer Channel, contact Apigee Support. 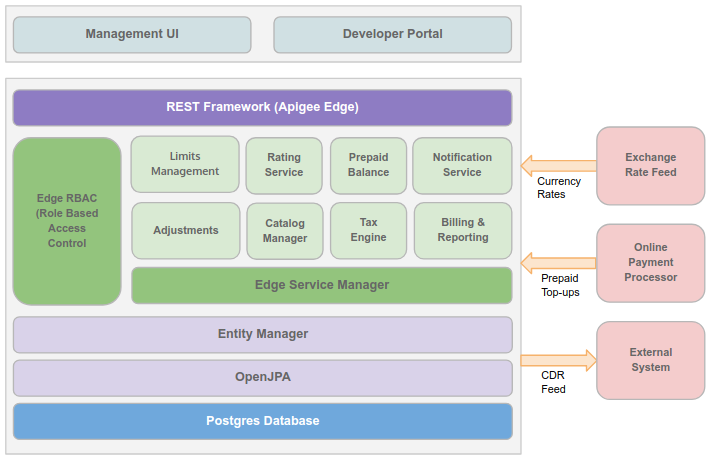 Edge Monetization Services is a new powerful extension to Apigee Edge for Private Cloud. As an API provider, you need an easy-to-use and flexible way to monetize your APIs so that you can generate revenue for the use of those APIs. Monetization Services solves those requirements. Using Monetization Services, you can create a variety of rate plans that charge developers for the use of your APIs bundled into packages. The solution offers an extensive degree of flexibility: you can create pre-paid plans, post-paid plans, fixed-fee plans, variable rate plans, “freemium” plans, plans tailored to specific developers, plans covering groups of developers, and more. 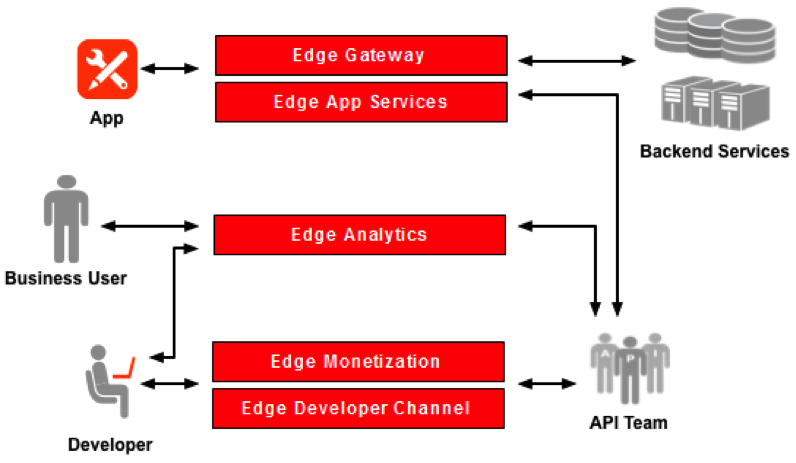 For more information on getting started with Monetization Services using Edge UI, see http://apigee.com/docs/monetization-services/content/get-started-using-monetization-services. An on-premises installation of core Apigee Edge for Private Cloud (Gateway and Analytics) provides the infrastructure required to run API traffic on behalf of the on-premises client’s customers.